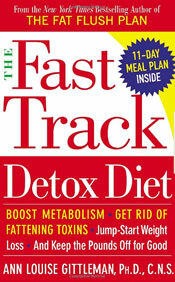 The Fast Track Detox Diet was written by nutritionist and best selling author Anne Louise Gittleman. The subtitle of the book states that dieters can boost metabolism, get rid of fattening toxins and safely lose up to 8 pounds overnight. As dieters lose weight toxins are released from fatty tissues and this increase of toxins in the bloodstream is known to be a major cause of mood swings when dieting as well as contributing to the slowing of weight loss. Gittleman attempts to address these issues so as to allow dieters to break through weight loss plateaus and achieve permanent weight loss. Gittleman asserts that in order to fast correctly it is necessary to prepare the body otherwise the fast may overload the detox pathways of the body. This could result in uncomfortable symptoms and may actually cause more damage to the metabolism. For this reason the plan involves seven days of preparation that is centered on organic foods selected specifically due to their ability to enhance the function of the organs of detoxification; the liver, kidneys, and digestive tract. This is followed by one day of fasting on Gittleman’s ‘miracle juice’ which is combination of cranberry juice, fresh orange and lemon juices, ginger, nutmeg, and stevia. This mixture is designed so as to reduce hunger, balance blood sugar, boost metabolism and nutrition. Dieters consume one cup of this liquid every hour as well as an extra cup of water every other hour. In addition dieters must take a serving of a ‘colon-loving’ supplement such as psyllium husk or ground flaxseeds both at the beginning and end of the day. After the fast there are then three more days where dieters adhere to the plan of the initial seven days. Dieters are also instructed to add specific immune boosting foods into the diet such as raw organic sauerkraut or low fat yogurt with live cultures. Many foods are restricted for the entire duration of the program including most fats, sugar, refined carbohydrates, gluten containing grains (wheat, rye, barley), soy protein isolates, artificial sweeteners, alcohol and caffeine. At least one to three ‘liver-loving’ foods or supplements which include cabbage, cauliflower, Brussels sprouts, broccoli, leafy green vegetables, oranges, lemons, limes, garlic, onions, eggs, artichoke, asparagus, beets, celery, and whey protein. At least one ‘colon-loving’ food or supplement which include psyllium husks, ground flaxseed, carrots, apple, pear or berries. Two servings of lean protein such as chicken breast. One to two tablespoons of flaxseed or olive oil. Look for other healthy meal ideas here. Dieters are instructed to only engage in very gentle exercise for no more than 30 minutes on the fasting day. Exercise on the other days is fine in accordance with the dieter’s current state of health and fitness. On non-fasting days try these exercises with The fast Track One day Detox Diet. The Fast Track Detox Diet retails at $12.95. There will also be additional costs related to the recommendations to purchase organic foods as well as the use of certain supplements and special foods. May be beneficial to jump-start a long-term weight loss program or to prepare for a special event. Rapid initial weight loss can increase motivation. Can help to reset appetite and taste preferences towards healthier foods in appropriate amounts. Offers a less strict version for those who feel unable to undertake the full program. Explains the scientific rationale behind the diet and the specific foods involved. Speaks to those who have tried standard weight loss diets without experiencing results. May help dieters to break through a weight loss plateau. Includes a detailed plan with recipes and a shopping list. Provides tools to deal with psychological factors related to dieting and weight management. Very restrictive and difficult to eat out. Requires preparation in order to obtain all the recommended items. Dieters may experience caffeine and sugar withdrawal symptoms such as headaches and fatigue. Some foods may be expensive or difficult to obtain. Program involves the use of certain supplements, which may be expensive. This program is likely to appeal to dieters who have tried other programs without results as well as those who are experiencing a weight loss plateau. It may also be of benefit for those who are experiencing a range of non-specific health problems such as digestive disorders, immune dysfunction and chronic fatigue. Gittleman, A. L. (2006). The Fast Track Detox Diet: Boost Metabolism, Get Rid of Fattening Toxins, Jump-Start Weight Loss and Keep the Pounds Off for Good. Morgan Road Books. I am 25 lbs underweight!!!! I can’t gain weight even as I have hearty appetite while struggling with SIBO. me likely and for Sibo…? i suffer from constipation and weight gain, any information to sontroll this id appreciate. do you have any suggestions what to do? liver cleansing etc. ok how much does this cost ? and will you deliver 2 EGYPT ? i need to loose weight fast because i really got depressed from my look .tell me what 2 do for losing 15 kgms in one month. you are doing great and it’s wounderfull.pls i will like to order for Acai Berry Detox and Bottle of Colon Cleanse.